On this day in history, 21st November 1559, Frances Brandon, Duchess of Suffolk, died at Richmond. She was buried in St Edmund’s Chapel, Westminster Abbey, on the orders of her cousin, Queen Elizabeth I, and her second husband, Adrian Stokes, erected a tomb in her memory. Her daughter, Lady Jane Grey, became Thomas Seymour’s ward and lived with him and his wife, Catherine Parr, for a time. Frances is buried in Westminster Abbey and her tomb, erected by Stokes, has an effigy of her on it. Author Susan Higginbotham has written some excellent articles on Frances and the Grey family on her blog “History Refreshed” – click here to browse them. Thanks Claire for the interesting facts. Very interesting! (There is a typo in the year she became a duchess, that was in 1551, not 1542). Thank you. Thanks for that, Christine, not sure why I put that when 1551 was in my notes and in Warnicke’s article! I would love to know how Frances felt about her young step-mother, and whether she and Henry were particularly harsh parents, for the time…. or was Jane just bad-mouthing her parents like many a teenager? It came from Wikimedia Commons – see http://commons.wikimedia.org/wiki/File:Frances_Brandon_tomb_effigy.jpg where the photographer has given permission for the image to be published. It is a wonderful photo as it really shows the detail. I don’t think there is any evidence that Jane was treated badly by her parents, apart from that one comment which, I feel, has been blown out of all proportion through the ages. Yes, I wonder what Frances thought of her father marrying Catherine Willoughby! David is just completing a new book for Amberley on Henry VIIII’s sister, Mary, wife of Charles Brandon.. famoulsy known to her contemporaries as ‘the French Queen’ much to her husband’s annoyance! That’s good news! When is it due to be published? Hi Claire.. not sure! David is ahead of schedule. His King and Queens of Enlgand (also for Amberley) will appear first but I will keep you up to schedule. He will complete by the end of the year. Love your site .. he has the print-outs and replies when he is here! Oh, that’s exciting news about another Loades’ book. Thanks, Claire, for another great gathering of facts–I can’t imagine how Frances might have felt about her father’s rather quick remarriage–to his ward and also his son’s betrothed? Do I remember correctly? It is interesting ot thing of what sort of mother she might have been–and if Jane’s comments were teenage (or just any child’s) complaints. Thanks! That’s interesting that there is only one citation about Jane’s harsh treatment by her parents. She’s so often depicted as bullied and abused by her parents but if you look at the surviving advice to parents in the 16th century, nips and bobs were very much the order of the day. Frances has so often been depicted as a cruel philistine in contrast to her gentle, bookish daughter. I wonder whether that’s really the truth. Exciting news about David Loades’s new book. There has not been enough published about either of Henry VIII’s sisters. Thanks, Claire, for mentioning my blog! I’m glad to hear that David Loades is doing a work on Mary. Frances may well have been close to her young stepmother. In a 1548 letter to Thomas Seymour, she referred to writing to him in a letter of “my lady of Suffolk” (that is, Katherine Brandon). Interestingly, Frances’s inquisition post mortem refers to her being married to Adrian Stokes in 1554 at Kew, a manor which was held not by Frances but by Katherine Brandon. After Charles Brandon’s death, Katherine had married one of her servants, Richard Bertie–perhaps it was she who encouraged the widowed Frances to marry Adrian Stokes, and hosted the wedding at her house at Kew? Very good read,its wonderfull to learn more and more on your site Claire, again thank you. I can’t waite ant Idea when the book will be done? I’m not sure who The Lady Boylen was? Would really like to know there where so many Ladys pretty hard to keep track. Best Wishes Claire. Another fascinating article. 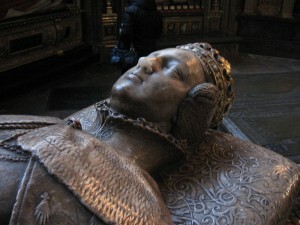 I saw her tomb when I visited Westminster Abbey a couple of years ago. Was she really so harsh? Jane must have been an awkward teenager to cope with. Though I’m sure she didn’t deserve the beatings. I would love to know what this woman was really like. Any thoughts Claire? Great posts, Claire. One thing, however, isn’t quite correct in these facts. Frances wasn’t in the Tower with her husband. While he was arrested, she rode all night through to her cousin Mary and early in the morning pleaded with her for the release of her family. It was due to this audience that Mary pardoned Henry Grey. Since Jane, however, had signed documents declaring war on Mary and had used the title of queen in it, she remained in custody. Frances, however, never was imprisoned. I think Warnicke is probably mistaken about Frances being imprisoned in the Tower. Contemporary accounts record that the Duchess of Northumberland was kept there for a few days, but they don’t mention Frances. There’s also a list of prisoners’ expenses that specifically names the Duchess of Northumberland and Jane Grey, among others, but doesn’t include Frances. The Duke of Suffolk himself seems to been free for a few days before being imprisoned, after which Frances went to Mary to plead for his release. what is the connection between Lady Jane Gray and Margaret DeChampernon and the Lady Jane Gray room in the Champernon manor. How are they related? Champercombe Manor was owned by the Champernon family and Lady Jane Grey was said to have descended from them. I have never looked into Lady Jane Grey’s roots so I’m not sure which branch of the family was descended from the Champernons – sorry!